“Turner has been here and fired a gun” A remark by John Constable to a friend at the opening of the Royal Academy show at Somerset House in 1832The thesis presented in this show is that JMW Turner, arguably the greatest of British painters, stood squarely on the shoulders of those artists he admired and copied – Rembrandt, Canaletto, Ruisdael, Claude, Titian, Constable and Poussin among at least 30 other “greats” of the European art historical canon. This show places these august artists on its elegant dove-grey walls next to our own dear Cockney rebel James Mallord William, late of Covent Garden. As obvious and natural a juxtaposition as this might seem, it appears that this exercise has never been done before – not for want of trying. The business of museum loans is a vexed one and in a most welcome piece of lateral thinking, scholarship, and resourcefulness, the result yields great pleasure and knowledge. The delight of seeing a painting of such quality as Rembrandt’s Mill of 1645-8 on loan from Washington is exquisite. But whatever the thesis of this exhibition, what we see here at Tate Britain is not a story of gentle artistic companionship, well-behaved paintings re-created and re-interpreted “con amore”, as its chief curator David Solkin insists is the case. It seems, at least to me, rather more a rivalrous exercise on Turner’s part. No shrinking violet he: it is much more a case of “look what I can do” if also “look what I can learn”. And what is wrong with that? Turner aquits himself variably well. In landscape he is superlative and often transcends his mentors. His skill in portraiture is not so convincing. I have to agree with a dyspeptic contemporary that his Jessica of !830 “look(s) like a lady getting out of a large mustard pot”. Setting it near Rembrandt’s Girl at a window of 1645 is an act of fairness but also great unkindness to JMW. As Newton says, knowledge is not formed in a vacuum, and Turner most emphatically did not spring fully-formed from the loins of history. The bone of contention, the question posed by this show, is this: was this admiration for his artistic forbears and peers companionable or competitive, rivalrous or adoring? It seems to me that the answer is that it is both. A reductive analysis of Turner as an adoring acolyte and in thrall to his forebears is too simplistic. As some of his versions of other artist’s works (and some are almost exact copies) this is a very tempting analysis. His Crossing the Brook of 1815, a landscape set contre jour against a pellucid sky, is not quite an exact transcription of Claude’s Landscape with Moses saved from the Waters of 1639, but is undoubtedly an homage. It also demonstrates Turner’s greater emotional depth. His magisterial formal looseness of brushstroke and alternative techniques which involve palette knife, rubbing cloths and applied glazes give his painting a glorious texture and tone that Claude avoids in a more intellectual form of painting. Anything you can do I can do better, you can almost hear Turner thinking aloud. 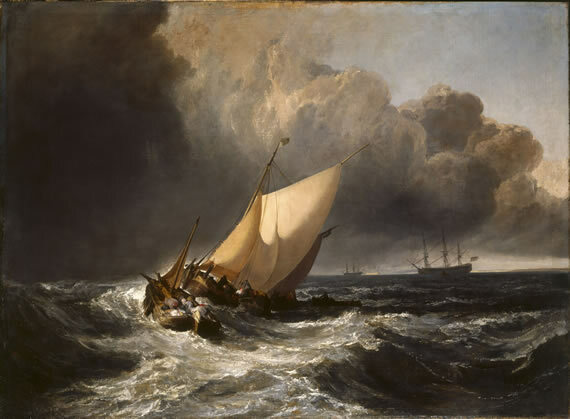 What makes this scholarly, erudite, rare and thought-provoking show so enjoyable is that placing a Turner next to a Rembrandt or a Constable or a Claude tells us more about BOTH artists. The sum is greater than its parts. This is the sign of a good show and a good story too. “Turner has been here and fired a gun”, said John Constable to a friend at the opening of the Royal Academy show at Somerset House in 1832. Constable’s remark, refers to the infelicitous (at least regarding Constable) hanging of a gentle Turner landscape Helvoetsluys (lent from the Fuji art museum in Tokyo) next to Constable’s own Opening of Waterloo Bridge, which had taken him 10 years to complete. Rivals to a man, Constable was extremely vexed that on Varnishing Day – a day when artists could “ touch up “their paintings already hung on the Royal Academy wall – Turner had the audacity to “ shoot him out of the water” by adding a spot of red “somewhat bigger than a shilling”. 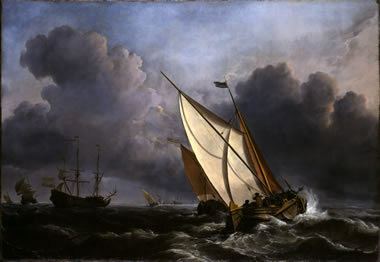 This act was deemed by Constable to be one of Turner stealing his fire by vivifying his own painting with more colour so as to set Constable in the shade. Not very likely, but it does seem that Turner was not acting con amore. Maybe his painting just needed that spot of red, but more likely his painting looked “unseasoned” next to Constable’s gaudy work. But perhaps the moral is that all is fair in love and war and art too.